ISPs use BGP today to exchange routing information between themselves and other ISPs and customers. 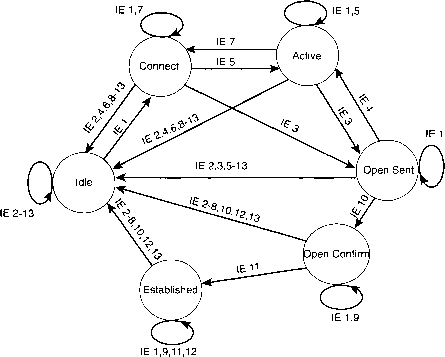 Whereas interior routing protocols might be concerned about advertising all subnets inside a single organization, with a large network having a few thousand routes in the IP routing table, exterior routing protocols try to make sure that advertising routes reach every organization's network. Exterior routing protocols also deal with routing tables that, with a lot of work done to keep the size down, still exceed 100,000 routes. BGP advertises only routing information to specifically defined peers using TCP. By using TCP, a router knows that any routing updates will be re-sent if they happen to get lost in transit. 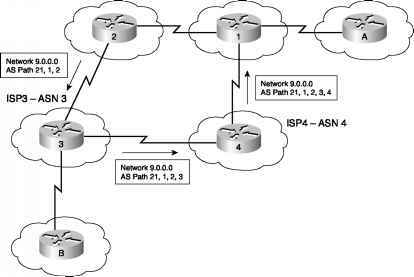 BGP uses a concept called autonomous systems when describing each route. An autonomous system (AS) is a group of devices under the control of a single organization—in other words, that organization has autonomy from the other interconnected parts of the Internet. An AS number (ASN) is assigned to each AS, uniquely identifying each AS in the Internet. BGP includes the ASNs in the routing updates to prevent loops. Figure 14-1 shows the general idea. Notice that in the figure, the BGP updates sent to each successive AS show the ASNs in the route. When R1 receives the BGP update from R4, it notices that its own ASN in found inside the AS path and ignores that particular route. BGP does not use a metric like internal routing protocols. Because BGP expects to be used between different ISPs and between ISPs and customers, BGP allows for a very robust set of alternatives for deciding what route to use; these alternatives are called policies. Routing policy can be based on the fact that an ISP might have a better business relationship with a particular ISP. For instance, in Figure 14-1, packets from Enterprise B toward Enterprise A can take the "high" route (from ASN 3, to ASN 2, and then to ASN 1) if ISP3 has a better business relationship with ISP2, as compared with ISP4. In the next section, you will learn about interior routing protocols and how they use some more obvious metrics.